Considering 86% of business intelligence (BI) users agree that BI data is important for businesses, it is vital not only to be able to access said data, but also to present it in a visually compelling manner. Clutch surveyed 308 data analytics users to identify the major trends, issues, and opportunities in visualizing BI data. The visualization and dashboard industry is highly competitive with hundreds of platforms from which customers can choose; for many customers, the options can seem overwhelming. This survey looks at the major trends in BI mobility, accessibility, open source, and key software features to help make choosing a BI solution easier and more transparent. 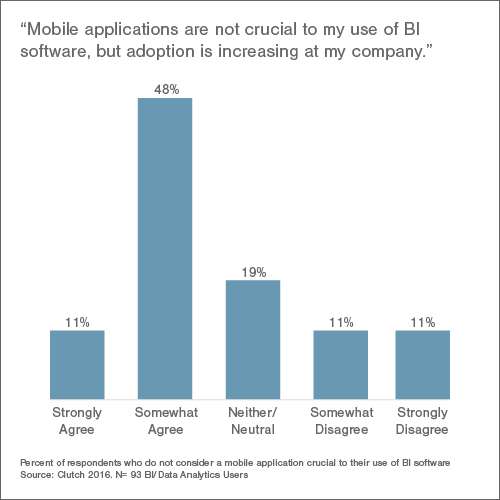 70% of data analytics users consider a mobile application crucial to their use of BI software. Of data analytics users who do not consider mobile applications crucial, 59% agree that mobile adoption is increasing at their business. 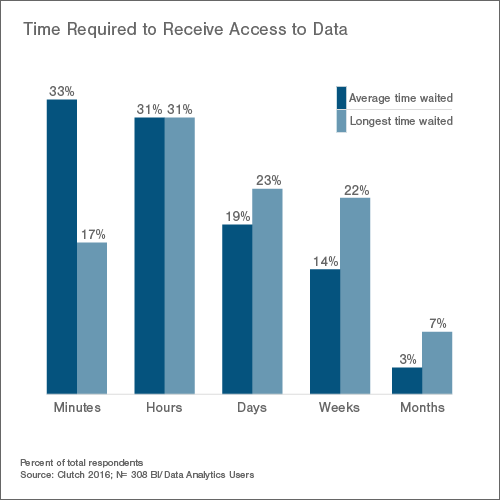 More than a third (36%) of data analytics users wait, on average, more than a day to receive access to their data. 83% of business users and 88% of data scientists are likely to use open source software —as opposed to paid, proprietary solutions—in the future. As modern devices continue to integrate mobility with the business world, BI tools are challenged with providing high-powered and easy-to-use alternatives to desktop platforms for the smart phone and tablet. Not only do advances in mobile processing power create an opportunity for BI companies to focus on mobile platforms, but the customer demand for these mobile alternatives is significant. 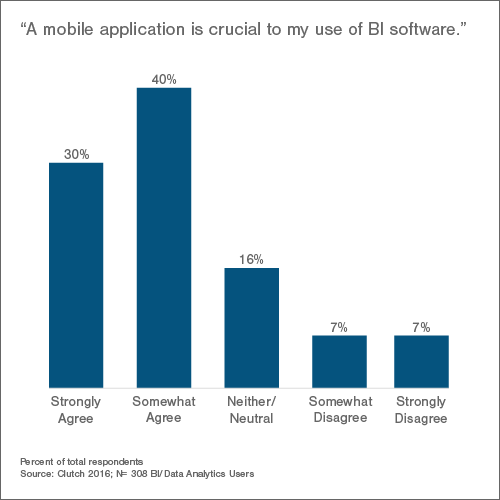 Of the data analytics users surveyed, 70% consider a mobile application crucial to their use of BI software. Of the 30% of users who do not consider a mobile application crucial, more than half (59%) still recognize mobility as an increasingly important aspect of their business. This focus on mobility is a significant change from previous years. Clutch’s 2016 BI Survey, which collected data from 291 data analytics users throughout February 2016, found that only 41% of respondents accessed their BI data through their mobile phone or tablet. As the demand for mobile BI increases, so too does the demand for mobile BI platforms that are capable of as much as their desktop counterparts. It’s no longer enough to simply view your data through a mobile application—data analytics users want all the functionality of a laptop with the ease of a tablet. In a hyper-paced business environment, data analytics users need to have the ability to work with their data on the fly, which means having access to a mobile BI tool that is powerful and smart enough to provide the same results as a desktop. Strong mobile capabilities offer an impressive, and appealing, amount of freedom to the average user. Recommendation: When choosing a business intelligence tool, ensure its mobile capabilities are strong and scalable. Even if mobile BI may not seem important to your business process at the moment, the trend towards mobility could take you by surprise if your BI tool is not designed to support a smart phone or tablet. 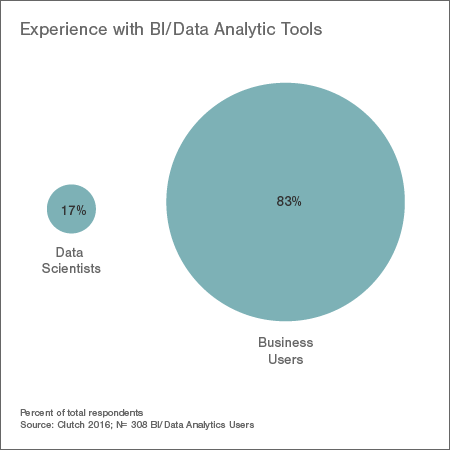 Receiving access to one’s data has quickly become a pain point for many BI users, according to Clutch’s 2016 BI survey. Almost a third of respondents (31%) said that accessing their data was not simple, and 43% also said they had to rely on another person in order to receive access. Not only do many users face frustration with the difficulty of access, but many still don’t receive their data in real time. 36% of respondents wait, on average, more than a day to access their data and only 17% have never had to wait more than a few minutes. Unreliable or inefficient data accessibility leads to a huge problem: employees attempting to utilize a BI tool to solve a business problem may not be able to review the data in a manner timely enough to make a real difference. “How fresh is the data? Are you looking at the data that actually came five minutes ago, or are you looking at data that came in yesterday? Getting access to data in real time, in say minutes, or maybe hours, is becoming a very, very big demand in the market,” says Yair Weinberger of Alooma. “Stale data” can also pose a problem when collaborating—or competing—with users who are unrestricted by such long waiting periods. In today’s business world, a week of waiting can mean the difference between the success and failure of a project. The increasing attention paid to mobile BI platforms offers a unique opportunity for business users to receive more immediate, real-time notifications of incoming data. Mobility allows users to check for updates regardless of the hour or location. Some enterprising BI companies have built entire platforms on real-time, mobile BI in an effort to increase accessibility and reduce time lag before receiving one’s data. Recommendation: Not all businesses collect the same data; some projects will always need multiple days to receive access, and some can be updated in real-time. Before choosing a BI solution, evaluate the data your organization needs for upcoming projects and plans, and find a platform that caters to your timeline—not the other way around. The Clutch 2016 Business Intelligence Data Analytics Survey showed that commercial BI options strongly dominate the industry despite open source options. However, according to our most recent survey, open source has gained ground. 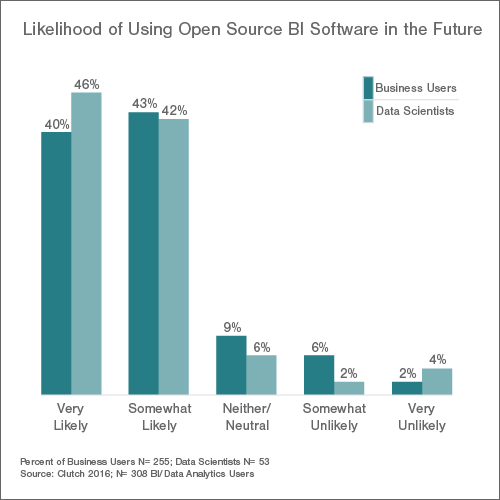 85% of data analytics users are at least somewhat likely to use open source BI software in the future. Though open source options have historically been passed over by the average organization because of steep technical requirements, business users (83%) are nearly as likely as data scientists (88%) to pursue non-commercial tools. The increased interest in open source software may be due to the fact that open source is a more cost-effective option. Experts also agree that open source options may be appealing as they allow users to have a more direct control over their data and access to a fast changing updates and trends in the BI community. However, open source options can be hugely time consuming for the average employee. As commercial options fight to compete with the increasing popularity of open source software, they will want to highlight the ease-of-use and simplicity provided by their out-of-the-box solutions. Luckily, commercial options offer something open source never can: customer service and professional support. Recommendation: When choosing between open source and commercial solutions, evaluate the technical level of your team, the time restrictions under which your team operates, and the monetary restrictions. There are pros and cons with both proprietary and open source solutions, the key is to understand which pros are most important to your business. Clutch’s survey included 308 respondents who are full-time employees and data analytics software users in the United States. Respondents are business users (83%) and data scientists (17%).